Also known as Soccer Kid. Aliens attempting to steal the World Cup have crashed as they tried to flee, and the Cup has been broken, its pieces scattered around the globe. As Kid Kleets, you must retrieve it. During your journey you will visit Britain, Italy, Russia, Japan, and finally the States. 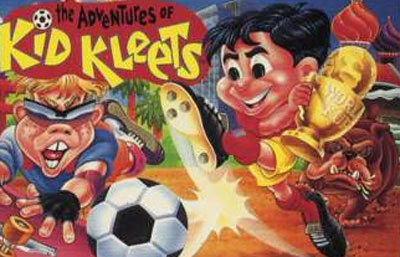 Kid Kleets is a platform game with some unique elements. You must kill enemies with your soccer ball. Soccer-style tricks of keeping the ball in the air and under control are especially useful - headers and overhead kicks can be performed with practice.